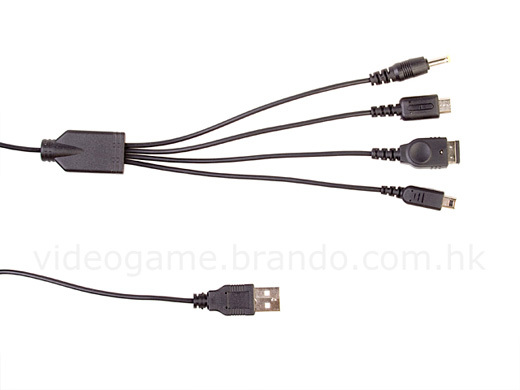 January 4th, 2009 by Alisha K.
If you can’t exist without the weight of several handheld gaming systems tugging at your pants, Brando has a new product that will make your downtime a little easier: the 7-in-1 USB charge cable. With this cable, you can use one USB slot to charge any Sony PSP or Nintendo GBA, as well as all models of the Nintendo DS. And, in a pinch, it might even serve as a belt, if you are very small. 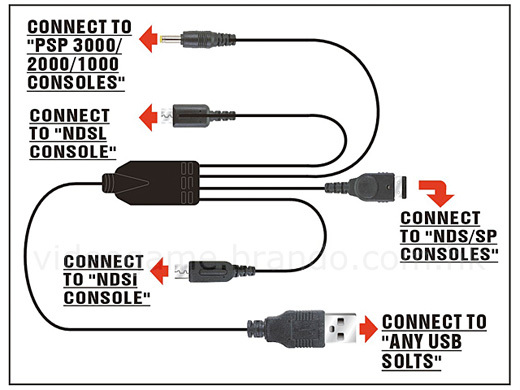 Brando even prepared a helpful diagram, as though you couldn’t figure out which cable matched its gaming system. What they don’t tell us is whether or not you can plug them all in at once. You know you want to, but the result might form into our new gaming robot overlord and seize control of the universe. Who wants to risk that? But then again, the cable’s only $7.00, so it might just explode, taking all your devices (and your computer) with it.